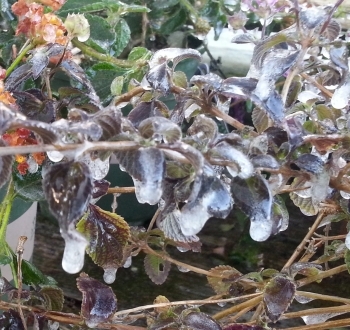 Ice on lantana after a cold night. Question: What plants do I need to protect? Many plants are hardy and do not require frost protection. However, there are some plants that can be severely damaged or even killed by cold temperatures. Typically tropical plants are frost tender and will need protection when temperatures drop below 30 degrees. Some of the frost tender plants include tropical hibiscus, bougainvilleas, mandevillas, tropical guavas, citrus (if temperatures drop into the 20's), cymbidium orchids, and certain varieties of cactus and succulents like jade plants and aloes. This, of course, is not an all inclusive list. If you have questions about what to protect, please give us a call. Plants that generally lose their leaves in the winter do not need to be protected from the frost. Question: How can I protect my plants? There are several ways to protect your plants from the frost. If your plants are in containers and you can move them, then you can move the containers against your house or put them in your garage. For plants that cannot easily be moved there are several options. Here are just a few ideas on how to keep your plants alive. -- Water the soil and the leaves of the plants. This will create warmth from the water and also the water that freezes on the plants will actually insulate the plant from the colder temperatures. -- There are products that can be sprayed on your plants that can give your plants a few more degrees of hardiness. Two of these products are Cloud Cover and Wilt Stop. They usually are available as a concentrate and can be mixed with water and then sprayed on your plants. They help seal in moisture and protect the plant from freezing. 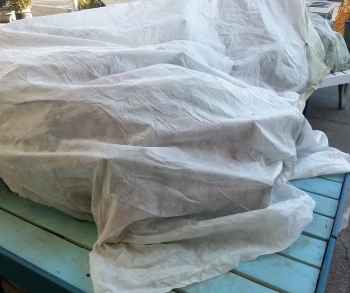 -- Frost blankets or frost bags can be placed over your plants. Frost blankets and frost bags are made of materials that still allow air and light to get through to keep your plants from being damaged. These types of materials can be left on the plants for several days without worry of causing damage to your plants. -- If you don't have access to frost blankets or frost bags, you can use old bed sheets or blankets. They can be placed on top of the plants. Sheets can be left on for several days, but blankets may need to be removed during the day depending on the type of blanket. -- Remember those old fashioned Christmas lights. You can string your plant with those and keep the lights on all night to provide some extra warmth. Don't use newer Christmas lights since they don't give off any heat. Question: What should I do if I forgot to cover my plants? That will depend on the weather. If there is still a freeze warning in effect or night time temperatures are still expected to be below freezing, we would recommend covering your plants following the recommendations above. Even if your plant has been damaged from not being covered initially, it is important to try to protect your plant from further damage. Question: My plants were damaged in the frost & look dead, what should I do? Even if your plants look dead, they might be alive. We recommend not giving up on them until late Spring (mid to late May). Many plants recover from severe frost damage, especially if they were well established in your yard for several years. Many have the desire to trim off the dead or wilted growth immediately after a severe frost. We recommend waiting to do any trimming until after the last frosts (usually mid to late March). When you do begin pruning, cut off the parts that are the most damaged. And then wait patiently through the Spring to see if they will return. Of course, if you aren't that patient and don't want to deal with frost issues, then you might want to replace that plant with one that is hardier and isn't susceptible to frost. If that's the case, you can remove it and replace it at any time.